Within PageGroup, there are four key brands, ensuring specialised service according to the standards and requirements of the roles being filled. Each brand serves a distinct market, and is able to respond to specific needs that come up for each of those markets. Across all four brands, we recruit for permanent, temporary, fixed term contract and interim positions. 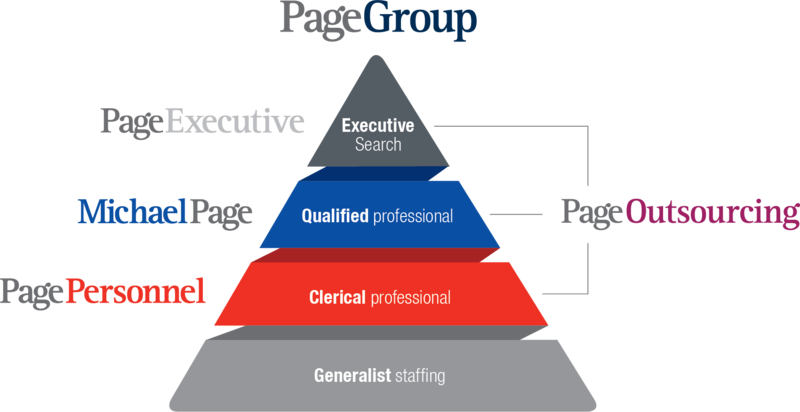 Page Executive is the executive recruitment division of PageGroup and provides a range of search, selection and talent management solutions. We are recognised for our powerful in-house research function, the speed and flexibility of our response, and our high success rates in finding qualified and experienced professionals for senior management and C-level roles. Leveraging the reach and resources of Page Executive, Michael Page and Page Personnel, Page Outsourcing provides a recruitment outsourcing solution that is flexible and can easily adapt to different hiring needs across industries. We specialise in high-volume hiring, short-term projects and specialist support for HR departments. Starting with members of our leadership team, which has an average of over 12 years of experience within Michael Page, we ensure that our consultants are true experts in their industries. Many of our recruitment consultants come from jobs in the industry they’re recruiting for, ensuring a technical, detailed understanding of the solutions needed. From this place of specialisation, they are able to offer expert advice to both companies and professionals throughout the hiring process. At Michael Page, we also keep a finger on the pulse of recruitment industry and each of the sectors we recruit in. We regularly research and publish updates about the state of various industries, giving an insider’s perspective to both companies and candidates in the form of reports, trends, salary information and other essential work related insights. With 6,750 staff and 140 offices worldwide, Michael Page has a strong global presence, giving us a large reach and impressive resources. However, we also pay close attention to the regional and local markets, leveraging the global network and combining it with local sensitivity. This creates an ideal mix of both international perspective and local market insights. We’re passionate about your progress. Whether you’re a professional or a company, our relationship doesn’t end when a job opening has been filled. We consider ourselves career consultants, and we stay in touch long beyond a simple job placement to ensure employers and employees alike are set up for long-term success. Michael Page is quality certified to several international standards. Our service levels and processes are regularly reviewed by internal and external auditors to ensure best practices are followed. Over 90% of our current business comes from personal referrals and repeat clients, which goes to show we’re committed to building long-standing partnerships and providing a quality experience each time. For several years now, we’ve been recognised as being among the most engaged recruiters on social media. For 3 years, 2015, 2017 and 2018, we won the global award from LinkedIn as Most Socially Engaged recruitment company. This shows the importance that our recruitment consultants place on long-term relationships and providing added value to businesses, including providing industry insights and information to those in the market. Our recruiters engage with both job seekers and companies looking to hire, and we are on the leading edge of trends happening in our industry. If you’re a business looking to discuss hiring requirements, contact us to speak with one of our recruitment specialists today. If you’re a candidate looking for your next great career move, search for exciting job opportunities in Singapore and apply directly with our consultants.